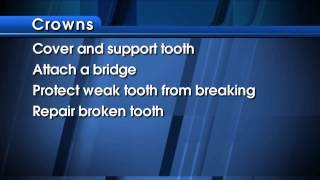 Repair broken teeth with dental crowns in Issaquah. Restore your tooth's strength, durability, and beauty. A dental crown, also called a cap, goes over the portion of your tooth that sits above the gum line. Once in place, it acts as the new outer surface of your tooth. The laboratory technicians at Discovery Dental can create your new dental crown of metal, porcelain, or both types of materials. Dr. Vanama tends to prefer porcelain because it resembles the color and appearance of natural teeth more closely. Dental crowns are sturdy and can last for a decade or longer with proper care. A crown restores the strength and shape of your tooth and prevents the need for an extraction and replacement. Your dentist in Issaquah always tries to restore teeth before exploring other possibilities. It typically takes two separate appointments with Dr. Vanama to complete placement of your new crown. During your first session, Dr. Vanama takes X-rays of the tooth to receive the crown and the bone surrounding it. Your dentist in Issaquah uses dental putty to take an impression of the tooth. She sends this to our dental laboratory for preparation of your custom dental crown. It typically takes two to three weeks for the lab to return the new restoration. We are happy to provide you with a temporary restoration in the meantime. At your second appointment, Dr. Vanama removes the temporary crown and ensures that the permanent one fits as it should. She makes any necessary adjustments before cementing the crown into its final position. You receive a local anesthetic first so the procedure is not uncomfortable for you. Such a great experience! They do a fantastic job and really ensure that you are comfortable. One of the best dentists I've ever been too.